Tomorrow marks the Thanksgiving holiday for 2011. As every year, I am thankful for a number for a number of things. To be quite honest though it has been difficult to keep those things at the forefront of my thoughts. This has been a rough year. It has brought loss, frustration, more loss, more frustration, and a bit of extra frustration for good measure. Its not just me either, I have watched the same types of things happen to people I know near and far. However. When I really think about it I have a great life and this year hasn't really changed that. I have everything I ever wanted. This is partly because I don't tend to want that much, and mostly because blessings beyond my control have been granted to me. I can look back on this year and see enjoyable bits too. Those are what I will choose to hold onto, and what I will actually detail. I have watched my kids learn how to do a lot of things. Kat is trying new dance styles, and learning to read music and play an instrument. Tobias is going through the process of learning letters, and preparing to read. He wants to read so badly he can taste it. Watching them build their wings one day at a time is both gratifying and terrifying. Carly? I can't think of words that don't sound lame. She is at the top of my thankful for list-- and anything I've typed to explain why sounds hollow compared to what I want it to sound like. Maybe one day I will get hit upside the head with the gift of poetry long enough to be able to write it properly. I think I have gotten better at photographing (you may disagree! :^) ). Even if I am not better, I am more confident and quite a bit faster. I have started to really learn how to play guitar. Its a fun diversion, and I play some things well enough they are at least recognizable. It also provides a way to clear out my mind. Photography doesn't do that, it never has-- probably never will. But I can play and be aware of nothing but the sounds. I guess I should also explain the image at the top. I watched Tobias making the classic hand turkeys today. So, I decided I wanted to make a turkey too. That is my result. 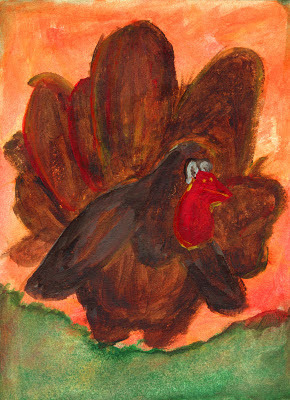 I wanted to try to use only fall-like colors, make the turkey reminiscent of the hand-turkeys, make it look child-like, and use acrylic paint. Despite not really being a painter, and despite making my turkey look a bit penguinish, and despite the green going on a bit heavier than I wanted.... I think I succeeded.